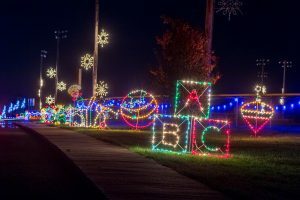 Panther Creek Park, located at 5160 Wayne Bridge Road, offers a lighted holiday tradition as you drive through the park to enjoy over 500,000 lights. Special thanks the I.B.E.W. Local 1701 and to all display sponsors who help to make this event possible. Enjoy this seasonal offering nightly from 6:00 pm – 9:00 pm. Senior Community Center of Owensboro-Daviess Co.
Joe Ford Nature Center Inc.